THE HISTORY: A victory in Tuesday’s race at Laurel Park would extend Rapid Redux’s North American consecutive win record to 21. It would also tie Citation’s modern era record of 19 wins in one year. Citation won 19 races in his three year-old campaign, which of course, included the 1948 Triple Crown. Hall of Fame horse Roseben also won 19 as a four year-old in 1905. THE RACE: The sixth race at Laurel is $5,000 Starter Allowance to be run at a mile and a sixteenth for a purse of $17,000. Post time is 2:56pm ET. THE WEATHER: Sunny with a high temperature in the low 50’s. 1) RAPID REDUX (3-5) – This will be the fifth race during the winning streak to be run at Laurel. 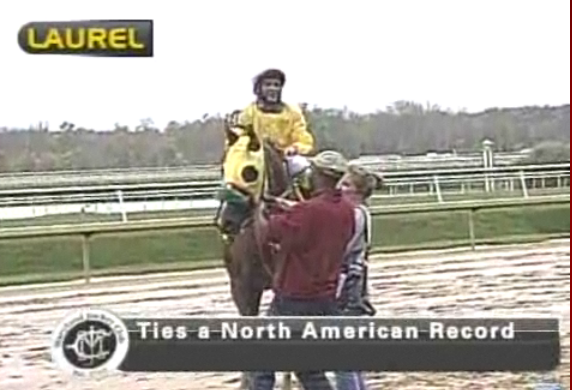 He has won at 5 furlongs and three times at 7/8th of a mile at this Maryland track. Jockey JD Acosta will be riding Rapid Redux for the seventh time during the streak. His last 5 Beyer Speed Figures have been remarkably consistent from 83 to 89. 2) AWESOME RHYTHM (6-1) – The five year-old has run his last three times at Laurel in $5,000 starter allowances. His best finish was a front running effort that ended in a second place finish on December 2nd. His last three BSF’s are: 77, 75, 68. 3) DERWIN’S PROSPECTOR (30-1) – Soundly beaten in his past four races, the three year-old has only one victory in his career. His most recent BSF’s are: 23, 25, 38. 4) NO BRAKES (5-1) – His last three races have been impressive. No Brakes is a deep closer that has been running in non-winner of two $25,000 optional claiming races. He finished third and second in his most recent races after rallying from last place. His most recent win by eight lengths came three back in a $5,000 starter allowance at Charles Town. He finished third to Rapid Redux on June 21, at Pen. BSF’s: 73, 77, 85. 5) SHAMROGE (8-1) – He won a $7,500 starter allowance at Delaware that was scheduled for the turf on Sept. 10. The four year-old has just one win in seven starts this year. BSF’s: 74, 75, 68. 6) FIRST NITE (10-1) – He won his most recent race at Laurel in a $5,000 beaten claiming race by seven lengths in front running style. First Nite was badly beaten in his two prior races. BSF’s: 79, 40, 52. 7) ZOSOGOOD (12-1) – The five year-old won his last three races at Monmouth Park. His most recent victory was a $10,000 N2Y claimer in front running fashion. The other two wins were at the $5,000 claiming level. His last three BSF’s are: 71, 65, 70. WHAT’S NEXT: Owner Robert Cole has announced that Rapid Redux will be retired at the end of 2011. Trainer David Wells said that Gulfstream Park has invited Rapid Redux to race at the Florida track on New Year’s Eve. Wells has expressed concern about how taxing it would be to ship long distances to race.